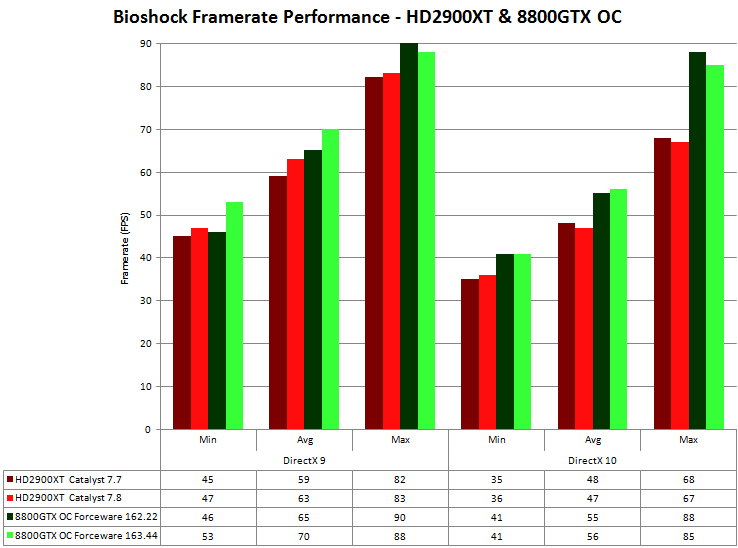 With BioShock being widely considered the first 'real' DirectX 10 benchmark game, the performance from both camps is very encouraging. Both cards were able to play the demo in all of its visually stunning glory, even if only DX9 for the HD2900XT, with a framerate as smooth as a baby's behind. With a driver tweak or game patch to fix the HD2900XT bug, it would have been a perfect showing all around. What might be of interest to more viewers however, is the indication that this gives for future DX10 titles such as Unreal Tournament 3 and Gears Of War. This game is built on the new Unreal engine, the same engine that will be used to bring these two blockbusting titles to DX10 on the PC. What we must now hope, is that other upcoming game engines such as CryEngine2 and co., will also sport the same level of performance.